Music sales were good with quite a bit of vinyl available. 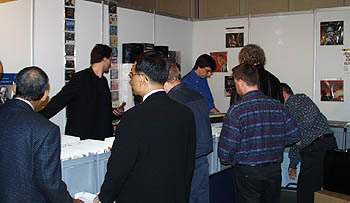 In fact more rooms had fully working turntable/analog setups than at any other show i have attended. The German's love their analog... and rightly so! 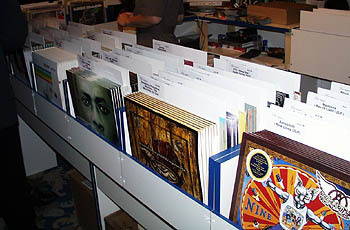 The below photo shows many current music titles (popular) for sale. These are all German pressings well packaged. Impressive! Tag McLaren's colorful loudspeakers were in full force at the Frankfurt show. 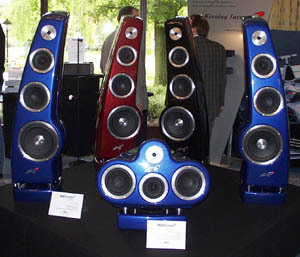 Their large F1 CA AvantGarde center channel (28,000 DM) is seen above with their large, about five foot high F1 AvantGarde mains (47,000 DM). Also photographed is their Aphrodite one-box system as seen below (9,900 DM) with Calliope minimonitors (5,450 DM). Both are available in various designer colors. 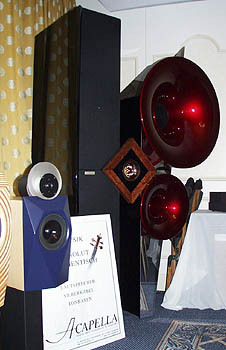 Looking a bit like my fave Avantgarde Acoustic Hornspeakers are the Acapella Trio Excalibur (160,000 DM). The Einstein gear seems to be a tube lovers dream. 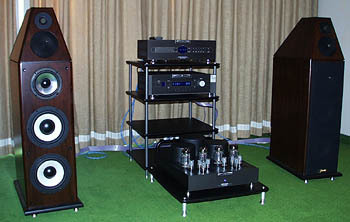 The Marvel line of tube units such as their Rohren-Vorverstarker preamplifier (14,000 DM). It uses no less than eighteen ECC88 tubes and also one ECC82 tube as well. S/N ratio is claimed at 95 db and it weighs a healthy 18 kg. 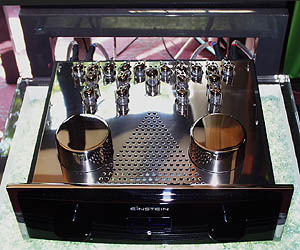 Also at the show was their OTL Rohrenmonoendstuf tube amplifier. 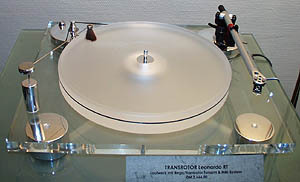 Popular and critically acclaimed in Germany, Transrotor manufactures a complete line of turntables. 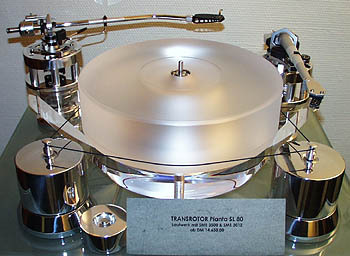 Seen above is their Pianta SL 80 (14,650) that uses three motors and can support two tonearms. Their Leonardo RT seen below (2,666 DM) is their basic single-motor model. 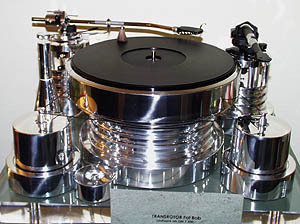 While you would feel that something called "Fat Bob" would be a guy seem on the Jerry Springer show, it is actually the name of a turntable! Of course those looking for super he-man ultra-shiny analog could get their Fat Bob (7,500) whose chrome alone will brighten your day. It also uses three motors and can support two tonearms. 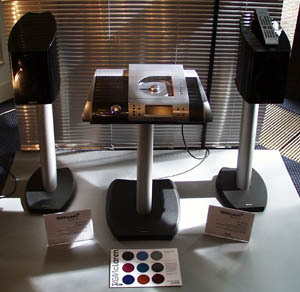 The Genesis Technology room was sounding quite good with the BAT VK 60 amplifier, VK 50SE preamplifier an VK D5SE CD player. 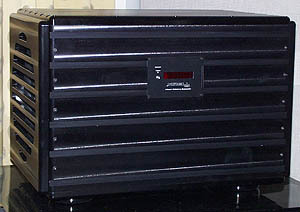 Mericus were showing a power amplifier named Stella (2,000) that is being introduced at the Frankfurt show. Why does my mind fill with a scene from an old movie? STELLA! STELLA!? If you must know its produces 500 wpc. at 8 ohms "Class AB".